This year's Garden Party, the first time on the DBG site, provides members and friends of the Gardens a unique setting to connect and celebrate the Piet Oudolf Meadow Garden, to see the progress our volunteers have made and to advance plans to Open the Garden Gates in 2019. Dagsboro Paint & Wallpaper Inc.
Join us as we gather for the Annual Delaware Botanic Gardens Fundraising Dinner Party — first time on the DBG site. Enjoy the evening in a beautiful open-air setting, sipping wine while dining in view of the Piet Oudolf Meadow Garden. Once again the dinner will be catered by Plate Catering of SoDel Concepts. Chef Ronnie Burkle, a member of the DBG's Advisory Council, has designed the menu to ensure a seasonal farm-fresh experience. Again this year, Banks Wine and Spirits, one of DBG’s most loyal and generous supporters, is offering their bourbon feature during this year’s Garden Party. Ted Banks will host a great Bourbon Tasting event featuring four single barrel bourbons including Basil Hayden, Maker’s Mark 46, Knob Creek and the Banks’ personally selected private Knob Creek barrel from Kentucky. Our Farm Dinner attendees can sample these great offerings as straight or mixed during the Cocktail Hour. Come join us as we sip Bourbon for the Botanic!! Annual Delaware Botanic Gardens Fundraising Dinner. Join us for a unique walk through the Meadow with Piet Oudolf while sipping some wonderful refreshments from Dogfish Head. On May 4, 2018, we will have just completed the second planting of the Meadow, adding 30,000 plants and grasses to the 17,000 we planted last year. Enjoy this behind the scene preview with the internationally renowned Dutch garden designer and author whose spectacular Meadow vision is being implemented at the Delaware Botanic Gardens. This chance to see the progress we are making on the Meadow, with the Meadow designer, is an opportunity not to be missed. Visit his other designs at www.oudolf.com. Join us as we gather for the Good Earth Market & Organic Farm's 10th annual farm-to-table dinner — a major fundraiser for Delaware Botanic Gardens. Enjoy the evening in a beautiful open-air setting, sipping wine while dining in view of the fields where your food is grown. Banks Wine and Spirits, one of DBG’s most loyal and generous supporters, is offering a new feature during this year’s Farm Dinner. Ted Banks will host a great Bourbon Tasting event featuring four single barrel bourbons including Basil Hayden, Maker’s Mark 46, Knob Creek and the Banks’ personally selected private Knob Creek barrel from Kentucky. Our Farm Dinner attendees can sample these great offerings as straight or mixed during the Cocktail Hour. Hope to see you under the big tent! Annual Good Earth Market Farm Dinner. Piet Oudolf, world-renowned Dutch meadow designer, nurseryman and author, is best known for the High Line in New York City. 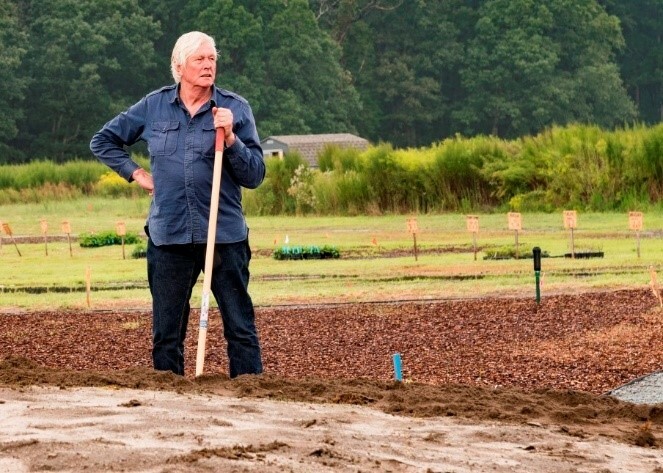 Piet will visit Delaware Botanic Gardens (DBG) for a Lecture and Reception. Commissioned to create a two-acre Meadow at DBG, Piet will be guiding the planting of the first part of the meadow at the garden site during the first week of September. Lecture attendees will also enjoy a sneak preview of an upcoming documentary by Tom Piper about Piet Oudolf. A limited number of Piet’s book Hummelo: A Journey Through a Plantsman’s Life will be available for purchase. SPONSORSHIP OPPORTUNITIES, LECTURE AND RECEPTION TICKETS ARE SOLD OUT. The Wait List is Closed. NOTE: The lecture by Sam Droege originally scheduled for this time has been postponed because he has been asked to participate in the Scientists' march in Washington, D.C. NOTE NEW TIME FOR THIS PRESENTATION! Join us for this Earth Day event—a virtual walk-through of the garden-to-be. A master plan presenting a detailed vision for the Delaware Botanic Gardens has been prepared by Robinson Anderson Summers, Inc., noted landscape architects in Wilmington, Delaware. Officials of DBG, including Raymond Sander, Sheryl Swed, and Gregg Tepper, will explain this plan in detail for lecture attendees. A master plan presenting a detailed vision for the Delaware Botanic Gardens in Sussex County has been prepared by Robinson Anderson Summers, Inc., noted landscape architects in Wilmington, Delaware. The public is invited to attend the release of the 32-page plan, to be held on March 30 at 6:30 p.m. and hosted by the Delaware Nature Society at its Ashland Nature Center, 3511 Barley Mill Road, Hockessin, DE 19707. Rodney Robinson, FASLA, LEED AP, and Allan Summers, RLA, LEED AP, key principals of RAS on the project, will provide an illustrated lecture on the garden’s scope and attractions. The event is open to the public without charge. Refreshments at 6:30 p.m. and lecture at 7:00 p.m. Please Rsvp to DBG Executive Director Sheryl Swed at sherylswed@delawaregardens.org or call 202-262-9856. Deer browsing has become one of the major problems deterring gardeners from growing ornamentals of all kinds. Choosing plants that deer find unpalatable is perhaps the best defense against browsing, without depending on expensive fences or regular spraying with deer deterrents. This talk highlights some native perennials that deer do not find appealing. Ruth Rogers Clausen has taught and written extensively about perennials, bulbs, garden design, and other horticultural topics. Her books include Perennials for American Gardens (coauthored with Nicolas H. Ekstrom), Dreamscaping, 50 Beautiful Deer-Resistant Plants, and Essential Perennials (coauthored with Thomas Christopher). Join us for this dinner at Lupo Italian Kitchen to benefit the Delaware Botanic Gardens. This monthly charity dinner features four courses paired with four wines. Bin 66 supplies the wines for the event; wines ordered that evening will return 10% of the sales to the garden. Doors open at 6:00 p.m., with dinner starting at 6:30 p.m.
Price is $50 + gratuity, of which $5 will go to the Delaware Botanic Gardens. Each dinner guest is given one raffle ticket on entry for a door prize. Between the third and fourth courses, additional tickets will be sold. Donations of door prizes are welcome. The more raffle tickets guests buy, the more money raised for the garden. For reservations, call 302-226-2240 or email meghan@sodelconcepts.com. Join with Governor Jack Markell and First Lady Carla Markell, chair of DBG's Advisory Council, as they launch the first phase of the Delaware Botanic Gardens. Come for a tour and refreshments beginning at 10:00, then meet and mingle with other garden supporters before the presentation at 11:30. Directions to the DBG site. At the corner of Main Street and Piney Neck Road in Dagsboro, turn east onto Piney Neck Road (look for Porto restaurant at this corner). Travel approximately 1.5 miles to the garden site, then past the DBG sign turn right at the woods edge. Having recently designed and developed a Delaware Garden with her husband, Osamu Shimizu, a garden designer, Holly will focus on lessons learned and how her approach to gardening has changed over time. Along with some good horticultural guidance, she will examine questions: What makes a great garden? How do we create garden spaces that are sanctuaries? How can we blend stewardship practices into our own horticultural endeavors? Holly Shimizu is a nationally recognized, award-winning horticulturist who has worked in many parts of the world. Currently she is involved in helping restore the Wilson Botanical Garden in Costa Rica. She is on the board of directors of the American Horticultural Society, Friends of the National Arboretum, and Advisory Council of the Delaware Botanic Gardens. For more than fourteen years she was the executive director of the United States Botanic Garden, located on the National Mall in Washington, D.C. Please note the starting time change to 1:00. The lecture and Q&A period will last about two hours. This is a great opportunity to visit the new Lewes Library. All lectures of the Delaware Botanic Gardens are free. A portion of each dinner will be donated to the Delaware Botanic Gardens. Come enjoy the good food and wine as well as the restaurant's spectacular boardwalk location. An artist who works with perennial plants, Donald Pell calls his gardens “impressionistic models of regional landscapes.” Understanding the biology of specific plants and how they integrate into any given landscape is the key to programming these gardens. He will discuss how cool- and warm-season plants are selected to stabilize soils and create desirable compositions. The role of ephemeral plants in building desirable seed banks while a garden is evolving will be examined. Donald Pell is the founder and principal landscape designer for Donald Pell Gardens in southeastern Pennsylvania. With more than twenty years in the industry, he is known for creating immersive gardens that embrace place and evoke the inherent beauty of the regional landscape. Help support the Delaware Botanic Gardens by becoming a sponsor of this popular event. Several categories offer free tickets to the dinner, held under a tent at Good Earth Farm. For businesses, this is a great opportunity to publicly show your support for this project, which will bring visitors, jobs, and income to Delaware. For individuals, the annual dinner provides a chance to help build a garden that will showcase sustainable environmental practices. Select your preferred amount below, then press "I'm in!," click on your cart, and complete your sponsorship. Thank you! THIS YEAR'S DINNER IS NOW SOLD OUT! THANKS TO ALL WHO ARE MAKING THIS EVENT A GREAT SUCCESS. It's not too late to become a dinner sponsor; see the following entry. The presenting sponsors of the 2016 dinner are Bancroft Construction Company, Banks Wines & Spirits, Piet Oudolf, Pennoni Associates Inc., and Robinson Anderson Summers, Inc. Landscape Architects. We thank them for their continuing generosity toward the garden. This year's farm-to-table dinner will once again be catered by Plate Catering of SoDel Concepts. Chef Ronnie Burkle, a member of the garden's advisory council, has designed the menu to ensure a seasonal farm-fresh experience. Spirits, wine, and beer will be served, including fine wines from Banks Wines & Spirits and our signature orange crush, provided by Dogfish Head. We also welcome you to become a sponsor (see the following entry) or to make a donation on the Join us page of this web site. All donations and ticket sales will count toward a match for a Longwood Foundation grant. COME TOAST THE GARDEN—AND HELP US GROW! Enjoy a four-course dinner with carefully selected wine pairings—then 99 Sea Level will donate part of each dinner cost to the Delaware Botanic Gardens. Call 99 Sea Level at 302-539-0299 to reserve your place for this unique dinner. APRIL 30, 2016 | 5:00 to 7:00 P.M. This spectacular oceanfront home offers an incomparable spot to toast the emerging garden and visit with other supporters while enjoying the seaside breezes. Many thanks to our host, Chuck Coltman. Select below the number of guests who will attend, then click on the button to add this purchase to your shopping cart and check out. The deadline for receipt of orders is April 24. To pay by mail, please send your check, payable to the Delaware Botanic Gardens, to P.O. Box 1390, Ocean View, DE 19930. It must be received by April 20. The Delaware Botanic Garden estimates that donations received in excess of $40 per person are deductible in accordance with IRS regulations. Your tax receipt will serve as confirmation of your reservation in lieu of a printed ticket. Learn about the edible and medicinal uses of wild plants of our forests, fields and backyards. This presentation focuses on native and naturalized local plants and how they have been used for food and medicine, including plants traditionally used as folk remedies and by Native Americans. Dr. Susan Yost is a botanist and an ecologist. From 2001 to 2014, she was the educator at the Claude E. Phillips Herbarium at Delaware State University, where she did educational outreach, worked with the herbarium's collection of 150,000 pressed plants, and taught botany courses in the Department of Agriculture and Natural Resources. Please note that the first half hour will be occupied by the annual meeting of the Delaware Botanic Gardens, an opportunity to learn about its progress. Daryl Kobesky will highlight various plants that present multiseason interest (including flowers, bark, fall color, and fruit) to help extend the gardening season and enrich garden wildlife habitat. He will discuss the importance of understanding each plant’s requirements for exposure and soil conditions and whether the plant has deer resistance. He is now production manager at Pleasant Run Nursery in Allentown, New Jersey, raising more than 1,200 cultivars. He has cotaught plant and design courses at Rutgers in its Continuing and Professional Education Department. Join DBG’s director of horticulture, Gregg Tepper, to celebrate one of the best groups of plants for the shade garden—ferns. This lecture features native fern identification, growth habits, culture, and an enlightening discussion of the best companion plants. Learn the redeeming qualities that make ferns a pleasure to grow and earn them a place of honor in your garden. A professional horticulturist, lecturer, consultant and lifelong native plant enthusiast, Gregg worked at Mt. Cuba Center in Hockessin, Delaware, where he held the positions of horticulturist, woods path horticulturist, and director of horticulture. He has lectured on native plants extensively in the United States as well as at the Royal Botanic Gardens at Kew and Wisley in Great Britain. He volunteers annually as a horticulture passer at the Philadelphia International Flower Show and cochairs the Watering Committee. So you think natives are weedy and messy? This lecture by Claudia West debunks this myth and explores the aesthetic value of native plants in modern-day landscape situations. You’ll be fascinated by the range of landscape styles and functional plantings created with our native flora. Numerous design examples and plant combinations demonstrate the beauty, diversity, and functionality created with regionally appropriate plants. We will explore how native species grow in the wild and translate this knowledge into powerful design principles for your landscape. Claudia West is planting designer and ecological sales manager at North Creek Nurseries, a wholesale perennial grower in Landenberg, Pennsylvania. Some 125 guests and Governor Jack Markell and First Lady Carla Markell, chair of our Advisory Council, gathered under a festive tent for this annual fundraiser for the Delaware Botanic Gardens at Good Earth Farm, Ocean View, Delaware. They enjoyed a fabulous dinner of locally grown foods prepared by Matt Haley's SoDel Concepts, a cocktail hour, a silent auction. The event quickly sold out. For more photographs by Ann-Margaret Donato, please see News/In the news.